As this country in 2015 prepares to acknowledge again all that it means to remember the Anzacs and the arrival of Australian troops in Gallipoli, Long Reef Golf Club remembers too. City and country communities have lists and lists of names on memorial stones and plaques of those who didn’t return. Here we can look at some who did return, and indeed got to play golf at Long Reef. We may not be able to walk in their shoes but we walk in their golfing footsteps. Every ANZAC, and every golfer has a story to tell. These stories below are but a snippet. The Armistice had been signed only just three years before Long Reef Golf Club was formed in 1921. Many service men were still returning well into 1919, at the height of the Spanish Influenza outbreak. They may have been forced to take their chances at the Quarantine Station in Manly or some may well have been billeted in pointy topped white tents along ’Bollocky way” a nickname given to the path above Fisherman’s Beach, for rest and recuperation. The Club’s early Memberships’ ledgers do not give service records of WW1, but up until a few years ago the A.I.F. Cup (1914-18) Honour board was on display in the Club. A copy of it is in the archives and it gives us our own list of names to research of those who returned. There would have been many more men in the competitions, but we don’t have their names. It is of interest that this competiton was not suspended for the duration of WW11, as many of the club’s major trophies were. We do not know if all the winners were in fact Long Reef members as they may have been guests. The qualification may have changed to include WW11 veterans after 1945, but the Services Cup (1939-45) catered for these men from 1946. S.I. Gilbert may have served in WW1, but it seems a little unlikely that he would have won the Cup 9 times, 7 of these occasions as a 70 year old. A.D. Barling must have been a consistent player to have won in the 30’s 40’s and 60’s. Some names above appear on other Honour boards. For example Eric Morton, winner in 1930 and 1952, enlisted under-age in WW1 and served in the Middle East, fortunately seeing little action. He joined LR in 1928 and following a long history of golfing achievements, including A Grade Pennant appearances, time on committee and six years as Vice-President; he was nominated for Life Membership in 1953. As far as research shows no one on the above list served at Gallipoli. Earlier this year, the club had returned to it, three trophies that were won by Percy Gary, by friends of the family. One of these trophies is a very attractive silver jug, which was Percy’s prize for winning the Cup in 1959. He won it on three occasions. Percy Gary served in WW1, and in WW2. He was born in 1892 in Oldham England, but had emigrated and enlisted in the Australian army. He married in England and his wife came to Australia in 1919 when he was discharged from the Australian Army. He served in France during WW1. He had joined Long Reef in September 1946. Every name has a story, and the tales of C.W. Whiting, cup winner in 1941 and 1949, along with E.S. Vidal winning in 1948, as 1914-18 returned servicemen, are really worthy of the telling. They serve as examples of an individual’s achievements during wartime. By highlighting their lives we hope to remember and acknowledge the sacrifices of all. Cedric was a Doctor of Medicine. He joined Long Reef on 1st September 1931. In “The first 65 years of LRGC”, written in the 80’s, Ross Lanes sings his praises. “Cedric Whiting was yet another with an incredible run of years of service to the Club. Between 1930 and 1949 he was Vice-President no fewer than 19 times and on committee once. Cedric lived at Parramatta as partner in a leading medical practice. He had a house at Collaroy for use at weekends and holidays. He was an experienced and competent golfer around the 11/12 mark. He was a very popularmember and after he retired from medical practice, he devoted considerable time to Club affairs, giving generous support to competitions and social functions.” Research into his military records has discovered praise for much earlier achievements. Cedric, William, Campbell, Whiting. – Military record reads as follows, M.C., M.B., Ch.M. : Major A.A.M.C., A.I.F., France and England; also A.N. and M.E.F., New Guinea. 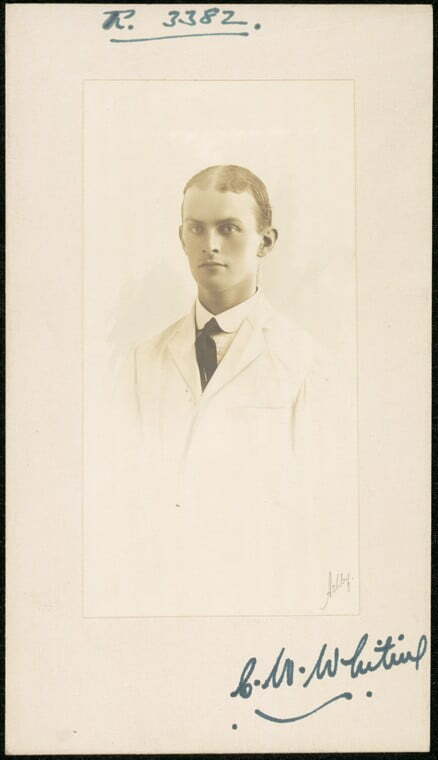 This photo, of a very young and fresh-faced young man, was taken on his Graduation as a Doctor in 1914. He becomes a surgeon two years later in 1916. He qualified as a Surgeon in the Field of War. The extent of the emergency medicine and tests of his surgery skills, in primitive front line situations to come, could not have been imagined in 1914. He enlisted the same year as his graduation in August 1914, and sailed to New Guinea on the 28th November 1914 with the Australian Naval and Military Expeditionary Force in the Army Medical Corps. War had been declared on the 4th August. By this time he would have been twenty-four years of age and by modern standards a very young Doctor. The action was to prove to be an initiation for what was to come in Europe, and Cedric was to experience and serve in every year of WW1. Most of it was on the bloody front line in France, but his war service began in New Guinea. On a happier note before returning to Australia, Cedric married at Government House in Rabaul P. N. G. on the 28th June 1915. This was where he was serving as also was his wife Mary, as she was a nurse in the army. 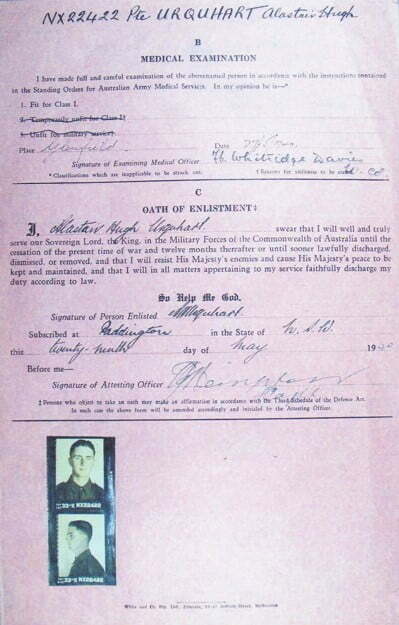 He returned to Australia in February 1916, enlisting or transferred immediately on the 1st March to the A.I.F. and proceeded to France. Soon after arriving in England he was diagnosed with Bronchial pneumonia and spent time in an English hospital. From here he joined the No, 3 Australian Casualty Clearing station at the Front, and served there for six months before being moved to the No.3 Australian General Hospital. He then served with the 12th Australian Field ambulance and battalions of the 12th Brigade until invalidated to England in January 1918. It seems that he was suffering with Gastric Ulcers. He then served as a Registrar at the No. 1 Australian Dermatological Hospital, Bulford, with the temporary rank of Major, until invalidated to Australia, arriving 13th June 1918. During his service, he was awarded the Military Cross and mentioned in dispatches. The announcement of the MC was made in the Sydney Morning Herald on 5 November 1917. Following below is the wording of a letter received by his wife in early 1918. “BASE RECORDS OFFICE. A.I. F.
I have such pleasure in forwarding hereunder copy of extract for, Third Supplement No.30251 to the London Gazette dated 24th August, 1917, relating to the conspicuous services rendered by your husband, Captain C.W. Whiting, 12th Field Ambulance. On his return to Sydney he was officially discharged on the 9 Oct 1918, but remained a member of the Army Reserve. He then rejoined the A.I. 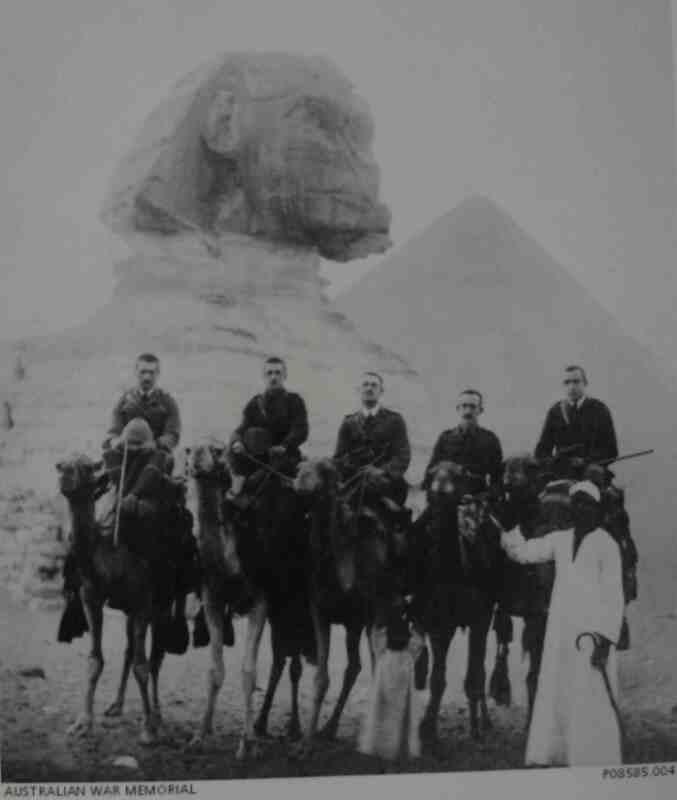 F, on 2nd July 1919 the following year, with the N.& M.E.F., the Naval and Military Expeditionary Force. He embarked from Sydney on the 15th July 1919 on the S.S. Melusia, as part of the Tropical Force, with the rank of Captain. He retuned to the garrison in Rabaul in P.N.G, arriving on the 29 July with promotion to the rank of Major as Acting P.M.O. He appears to have served here until 1921. As a golfer Cedric continued his membership from the late 20’s at Long Reef until 1964. As well as all his years of service on the committee throughout the 1950’s he was a regular competitor in all competitions and in his 60’s maintained a handicap around 14. He had been living at Fairlight from 1959 but he died in Dundas, Sydney on 3rd September 1982, at the age of 92. His wife had died a few years before on the 8th January 1977 in Parramatta. They must have been married for fifty-two years. They did not have any children. As a second example of a returned first WW1 soldier who went on to play at Long Reef we look at a veteran whose names suggest an ancestry that would be a research project of its own. Like Cedric, he was to be mentioned in dispatches and later awarded the Military Cross. We can quote from three documents from military records which describe his actions. “On the night of 24th/25th September 1917 near HOOGE, east of YPRES, Captain Vidal led a convey of 60 motor lorries with material for CHATEAU WOOD. The difficulties to contend with were exceptionally serious, about ¼ mile of road being single way planks. The traffic congestion was considerable and the enemy was heavily shelling HOOGE and CHATEAU WOOD. In spite of mishaps such as 2 lorries receiving direct hits and 2 others getting into the mud, Captain VIDAL succeeded in getting 31 lorries unloaded at the required spot. At this stage one point of the road became entirely blocked, and the remainder of the lorries could not get beyond it, but the material was unloaded within easy carrying distance. The whole operation required the greatest determination, skill and leadership, and but for Captain VIDAL’S resourcefulness and courage, serious loss of property and casualties would have undoubtedly resulted. 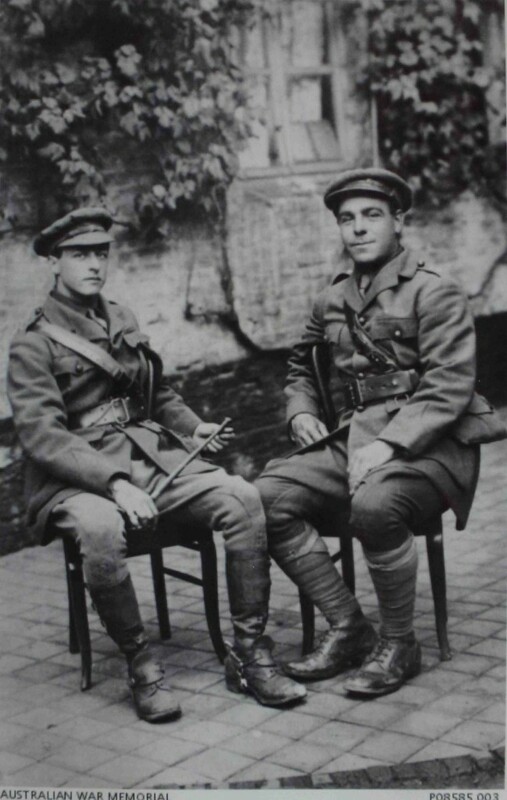 On each of the nights 26th, 27th and 29th September 1917, Captain VIDAL led his company to the front line in POLYCON WOOD, East of YPRES and successfully carried out the wiring of the front line system in conjunction with Field Company. “On the night of 4th/5th July 1918 east of VILLE–sur-ANCRE, Capt. VIDAL was detailed with a party of 100 men to dig a Communication Trench from the original front line to a trench that had been captured that morning. The enemy made a determined counter-attack during the early part of the evening, accompanied by a very heavy bombardment over the captured area. Capt. VIDAL kept his party so close as possible to the work out of shell fire and, as soon as this slackened, led his men straight on to the work, which he completed within 2 hours. A further heavy bombardment was put on the captured area immediately afterwards, but, through Capt. VIDAL’S carefulness and judgments in watching the shell fire, the whole party returned to camp having successfully carried out their work without a single casualty. A third account illustrates his courage and leadership on the front line. “E. of GUEDECOURT during the latter part of Nov 1918, Capt VIDAL was entrusted with the digging of a communication trench (ENDLESS ALLEY) to the front line system. The weather conditions as well as the enemy shelling were exceptionally severe and the work entailed great hardships on the men who often had to work for hours in mud and water up to their knees. However owing to Capt.VIDAL’S courage and energy the men maintained their morale and the work was pushed through. Also worthy of mention, as a gesture of telling a few stories but aiming to remember all those who served through a very select example, is the story of Oswald Devenish-Meares. He is not a winner on the Board above, but as the Club’s Secretary Manager in the 40’s, after the WW11, he would have been responsible for keeping the Board up to date. He was also a member, a talented golfer and a veteran of WW1. To see his story, click here. Another Honour Board to have gone missing over the years is a list of those who were members of Long Reef and died in WW11. For a long time it was abandoned to live in the roof space of the club, but when discovered and saved (by Mick Snell) and brought down but sadly has disappeared since then! The Membership book of the time, 1939-40, gives some references to men who left the club temporarily to serve, but does not always list just what happened to them. We do know that the following men died in action, having taken temporary suspension of their golf club membership, as it is recorded against their name in the 1939-49 Memberships Ledger. All five men are shown on the Australian War Memorial. -Geoffrey I. Cohen – Result of an accident in the UK. 3/8/1941. There were no details of the accident. -Llonda Holland (Major and M D) – Killed in action while serving on the hospital ship “Centour” when sunk by Japanese off the coast of Queensland 14/5/1943. -Eric Mortimer Lowrey – Died of an illness 9/1/1945. -David Bloomfield – Died when his aircraft was shot down in the English Channel off Calais 28/3/1942 His body was never recovered. From the Board on display in the Club House right now, and the list of winners of the Trafalgar Day Cup (Navy) we know a little about some of the members who served in WW2. For example there was William George Hunt, originally from North Cottesloe, WA who served as a Sergeant in the A.M.F. and received a citation for Gallant and Distinguished service in the “S.W.P.” This was presented by The Lieutenant-Governor of Western Australia on 9th July 1946. He had joined Long Reef on 25th June 1939, and won the AIF Cup (1914-18) in 1946. Alastair Urquart lived a very long and active life and he serves as an example of those who fought between 1939-45. As mentioned above every name has a story. Long Reef has had so many high achievers in all aspects of life become members. What of Alastair Hugh Urquart, AO CBE? Alastair won the Services Cup in 1949. He was born in 1919 and like Cedric Whiting lived a long and very active life in spite of being in danger’s way throughout the war years. He had enlisted in the Army on the 29 May 1940, was discharged in 1945 and joined Long Reef on the 9 March 1946. For those of us who are not familiar with an Oath of Enlistment this is what he signed in May 1940. I Alastair Hugh Urquart swear that I will well and truly serve our Sovereign Lord, the King, in the Military Forces of the Commonwealth until the cessation of the present time of war and twelve months thereafter or until sooner lawfully discharged, dismissed or removed, and that I will resist His Majesty’s enemies and cause His Majesty’s peace to be kept and maintained, and that I will in all matters appertaining to my service faithfully discharge my duty according to law. Subscribed at Paddington N.S.W. 29th May 1940. In September 1942 during the Battle of El-Alemein he was shot by a German sniper. He lost a kidney. While recuperating, he asked the surgeon, “What’s my life expectancy?” “What is your age?” “ Nearly 25.” Urquart responded. “Oh, then you should make another 25 years.” He died at the age of 91 in 2011. He was born in Manly, the son of a grazier from Gunnedah, and when he was six moved to Collaroy. He was a gifted scholar and sportsman and attended SCEGGS, but did not continue his education, as he had to leave school when his father’s health failed. He started what was to prove to be a long career in finance in 1937 as an audit clerk. A year later in 1938 he joined the Citizen Military Forces serving with A Company of the 2/17th Battalion. Early in the war he sailed for the Middle East, where he fought in the Siege of Tobruck in 1941, and after being wounded at El-Alamein returned briefly to Australia. He then returned to England to help repatriate Australian prisoners of war. Following the war an interest in the Stock Market was to become a lifetime work. 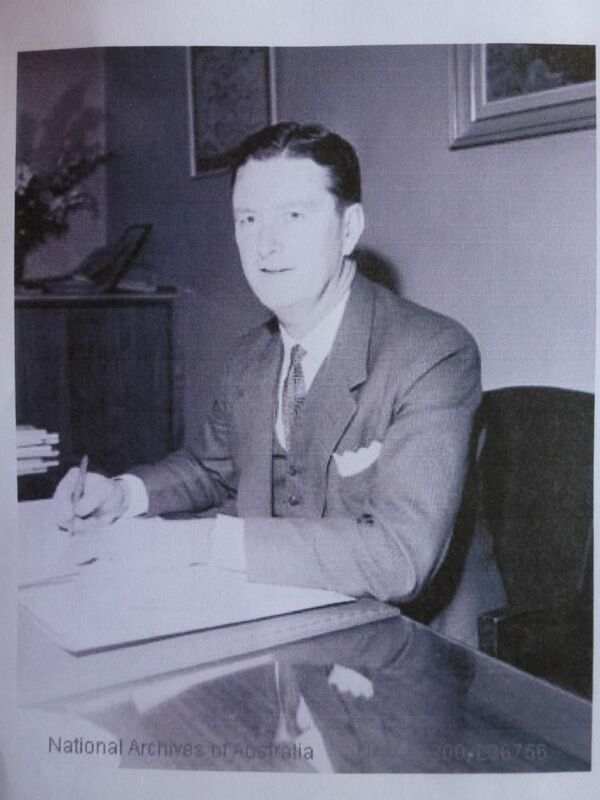 In 1947 he began his stockbroking career with Ralph W. King and Yuill. In the same year he married Joyce Oswald, and built his first home by hand himself in Suffolk Avenue Collaroy. In 1949 he became a partner with Mullens and Co, and in 1950 a senior partner where he remained until 1984, and acted as a consultant until 1990. Over the years his and his wife’s photo could be found in the society pages, including his attendance at Royal Garden party at the NSW Governor’s house. But it is his connection with the Stock Exchange which marks his greatest achievements. He served on the committee of the Stock Exchange from 1954-66. During this time he served as Vic-Chairman from 1955-59. He also served as Chairman from 1959-66, the youngest president of the Sydney Exchange since its founding, in 1872. During his time he led the introduction of computerisation at the exchange and presided over a rewriting of trading and listing rules. Also under his chairmanship, the Securities Institute of Australia was established. He was made an honorary fellow of the Australian Stock Exchange in 1991. He was at one time a president of the Union Club in Sydney, chairman of the NSW Building Society and later Advance bank, deputy chairman of P&O and chairman of Chubb Australia. He was a council member of the NRMA and a director of the Royal North Shore Hospital. He had already received an OBE in 1967 for services to the community. That same year he moved across to non-playing membership. He worked with the Salvation Army, Red Cross and Heart Foundation, and served as a trustee of the Opera House from 1969-1981. He wouldn’t have had time to miss his game of golf! He also had a passion for rugby, supporting Manly and NSW and rarely missed a Waratahs’ game. In 1994 he was made officer of the Order of Australia. All this with one kidney, after life saving surgery in 1942! What a life well spent! We know that he won the LRGC Services Cup (1939-45) in 1950 at the age of 31. What a Treasurer he would have made for the club, but he is not listed in any of the committee members lists. Golf was probably his only way to get away from facts and figurers, and this he could do living just across the road! On Anzac day, may we remember all who gave so much, and for those who returned, to thank them and hope they enjoyed being members of Long Reef Golf Club. Further stories and accounts very welcome.